Dublin - Wales will have to wait a day to receive the Six Nations trophy if the team manages to pull off an unlikely title victory in Saturday's competition finale. Wales, Ireland and England are tied on six points heading into the final round of the Six Nations, but the Welsh have a much inferior points difference of plus 12. England is on plus 37 and Ireland plus 33. The Six Nations trophy will be stationed at Twickenham, where first-place England plays France in the late kickoff in Saturday's staggered start times. 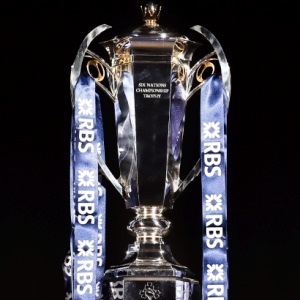 A replica trophy will be at Murrayfield, where second-place Ireland plays Scotland in the second game. Wales opens the final day with an away match against Italy. "We felt we had to send the trophies to the grounds where the teams with the highest points differences were playing," organizers said Monday. "If Wales win, the players would receive their medals at the post-match dinner in Rome and we would organise a presentation for the following day when they return home." The title has been decided on points difference in the last two years, with England losing out both times. England coach Stuart Lancaster is looking for his first Six Nations title since taking the position after the 2011 World Cup. "The emphasis on Saturday will be to get the performance right first and foremost," Lancaster said Monday. "It's impossible to insulate the players from the results of the previous games because 82 000 people are shouting it at them when they run on to the field. By the time the Ireland game finishes, we'll know what the objective is and will feed that through to the key decision-makers." England could even finish as low as fourth if it loses to France, which has four points and is still mathematically in contention for the title. Wales is facing a crisis at prop, with Samson Lee ruled out because of an Achilles injury and Gethin Jenkins injuring his hamstring during the 23-16 win over Ireland on Saturday that threw the competition wide open. Despite the injury situation, Wales will not be turning to 95 times-capped Adam Jones, who surprisingly announced his retirement from test rugby before the Six Nations. "It was his decision in the first place to hang up his boots on the international front," Wales assistant coach Robin McBryde said. "There is no need to call him at the moment. As far as I'm concerned, he has announced his retirement. At the moment, we have enough strength in depth."